Horsham and surrounding villages could become ‘noise ghettos from hell’ if a second runway at Gatwick is allowed, campaigners have claimed. Communities Against Gatwick Noise and Emissions (CAGNE) has released research suggesting that the airport’s expansion plans violate Government policy on aircraft noise by failing to incorporate measures to reduce its impact on residents. 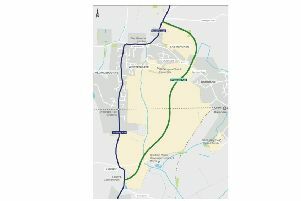 The campaign claims that Gatwicks’ lack of a noise mitigation strategy is in contrast to proposals submitted by Heathrow, and could create a 24-hour ‘noise ghetto from hell’ for areas such as Horsham, Rusper, Slinfold, Broadbridge Heath, and Faygate. The Airports Commission backed a third runway at Heathrow over expansion at Gatwick last summer, but the Government has yet to make a decision, although an announcement is expected in mid-September. Sally Pavey, chair of CAGNE, said: “No community in the UK is subject to constant aircraft noise but that’s exactly what Gatwick are proposing with their expansion plans which offer no noise respite for overflown communities and would create a 24-hour noise ghetto from hell by operating flights every hour of the night. “I would remind the Prime Minister Theresa May that not a single local council or local MP – all of whom are members of her slim Conservative majority – supports Gatwick expansion. According to CAGNE, Gatwick’s expansion would double the number of people impacted by night flights, and the airport’s own proposals include mixed-mode runways offering no respite for overflown communities, operating with no night-flight ban, and operating without steeper approaches or displaced landing thresholds to reduce the noise to residents. Its research suggests that Warnham, Rusper, Broadbridge Heath, and Slinfold will witness a new departure route over areas not previously flown over, as would Ifield and Faygate, while Horsham would be much closer to aircraft noise and would be overflown. Gatwick Airport was approached for comment but has not responded.